I chose to do some stitching on this one and if you come back tomorrow I will be taking a little break from the Pooh Series and will be presenting a video on how to sew on your cards. I would really like to tell you what the paper is but I pulled it out of my scrapbox so I have no idea. Sad but true! I used a rub on for the sentiment on the front and the inside sentiment is computer generated using the Hallmark Card Studio. 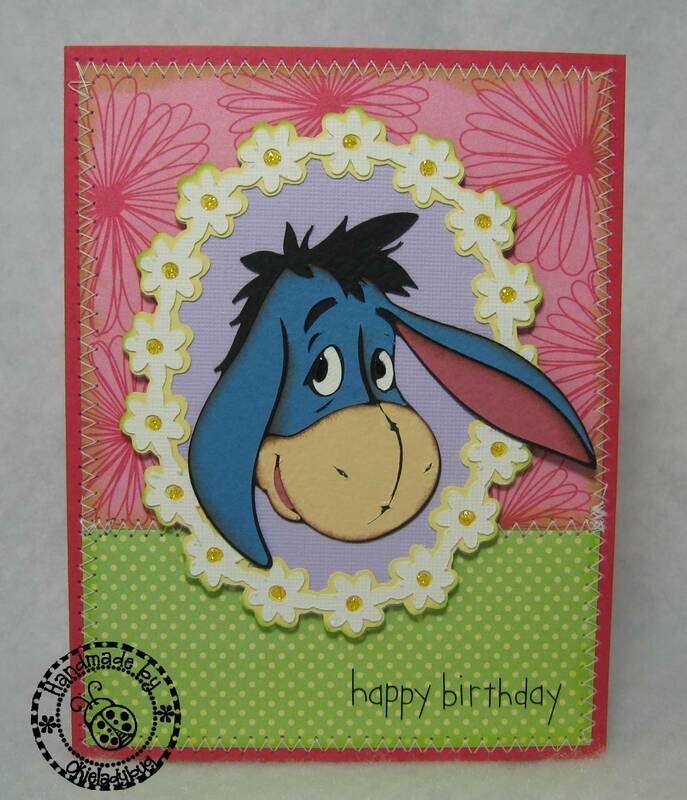 I do like how Eeyore's ear seems to jump off the card since it is out of the frame. Oh I bet you are wondering about .cut files...are you? HUH? HUH?? Well okay I will give you the .cut file for yesterday and today's cards!! 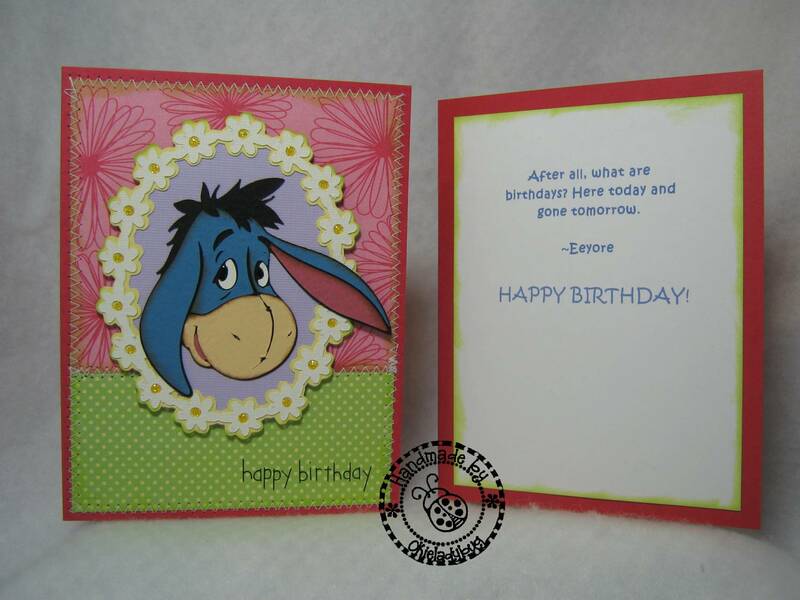 So if ya want to make your on Eeyore birthday cards just click here ----> EEYORE BIRTHDAY CARDS. Now remember I will be taking a break tomorrow from the Pooh Series and posting a video tutorial but don't worry I will be back to finish the series! So.....will you be making an adorable decorated box to put all these lovely cards in before you send them all to me? :) These are right up my alley you know! awwwwwwww ... now isn't Eeyore just the cutest!!!! Another great card Okie! That came out really nice. I like it. I am loving your Pooh series! Cute card. Came out really nice. i like the pooh series. Cute card. I love Winnie the Pooh and the other characters. I have a Winnie the Pooh collection. Really love these cards!!!!! Can't wait to see what's next!!!!!! TFS!! I love Pooh and all of his friends. I sure watched lot of Pooh when my 15 y/o Grandson was little. Again! Yes, it's adorable. I loving these. I like this one the best. The way he's cutting his eyes makes his face so cute! I know where the red/pink paper came from......a stack from Sam's Club that I shared with you waaaay back when! The stitching looks really good on this. That little Janome has a pretty stitch on it. I can't wait to see your Pooh cards in person. If there was enough countertop surface available in my scrap room so my machine could stay out I'd do more stitching on my cards too. I'm just too lazy to set up a table or move enough stuff for it! Eeyore is my favorite. All the other characters were strange to me as a kid. Eeyore kept it real. He always told the truth and would tell the others how the situation was going to work out in the end. No one listened but he was always right. I think someone spiked Pooh's Honey Pot with some happy juice. He was just too out of it to me I remember asking what is wrong with Pooh. I never got an answer. LOL. Great card Shirley. OH WOW!!! I love LOVE L*O*V*E This card!!! Sooooooooo SUPER CUTE!! I love it! :) pooh & his friends are my FAVE!!!! These cards are the cutest!!! I think I like this one best. They are both really cute vut this one is my favorite. Love...love...love this card. It is so very cute. Darling card - I love stickles too. Oh, Okie I love you.....I ber you hear that a lot. I love to visit your blog right before I go to bed, or first thing in the morning because you always make me laugh...I do the hand thing like in the game shows also!!!! Maybe it's an Oklahoma thing cuz I live in Norman! cjbarclay at gmail dot com...in case you want to send me something then I can email you my address "sigh"
just say a great BIG thank you for every thing. I have learned a great deal from you. He's really cute! I do like how your Eeyore's smile. And I didn't even know there was such a pretty frame on that cart. Thanks for sharing such pretty cards! Such a cute card. I agree, I like that Eeyore is smiling. Where is that darling daisy oval from? 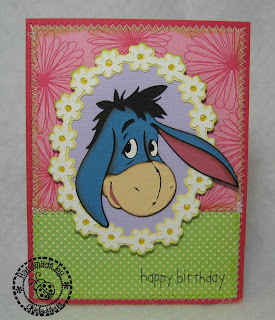 I love this EEyore card!!! Awww! He's just to dang cute! TFS! So very cute! I love the frame of flowers around his head and the color card stock you used on his face. Beautiful blue! Ahhhh so cute, i just love it!!! He's so stinkin Cute! I love the daisy frame! 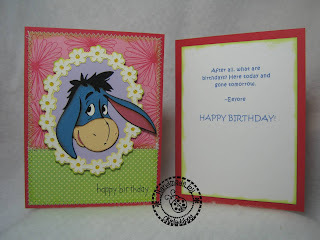 Eeyore is one of my favorites, next to Tigger & Roo! OOOOH this one is def my fave so far! I love the colors and especially the pink paper, and the daisy frame, and the stickles, and the stitching - yep, my fave for sure! !